The Confederation Bridge spans the Northumberland Strait in Queens, Prince Edward Island for nine miles. Crossing the Northumberland Strait in Queens, Prince Edward Island has become quite a bit faster since the Confederation Bridge was completed in 1997. To make up for the cost of building the bridge, there is a toll charged but most people do not mind the fee as the time difference to get between Prince Edward Island and New Brunswick is significant. Confederation Bridge and Northumberland Strait seen from Borden-Carleton, Borden Point, Queens, Prince Edward Island, Canada. 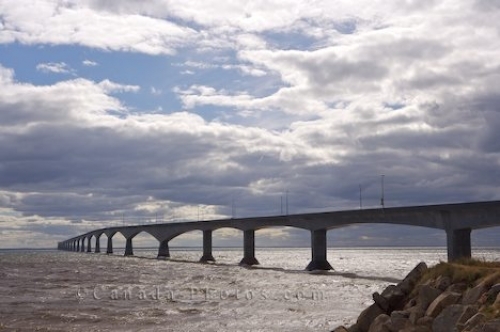 Confederation Bridge is 13 km (9 miles) long and was completed in May 1997. Picture of the Confederation Bridge that crosses the Northumberland Strait in Queens, Prince Edward Island in Canada.